Have you just written your first book? Take a deep breath because you’re one step closer to get your book published. And don’t think publishing houses won’t be interested in your book because it is your first one. Below you’ll find 19 top publishers for first time authors. Blaze Vox Books is a publishing company that’s no stranger to first-time authors. Founded in 1999, they represent a wide range of books from poetry collections, to children’s books, to genre fiction, Blaze Vox Books takes their time to discover new authors and use their expertise to help them begin on the right foot into the publishing industry. They’ve produced books like “Frame Narrative” by Dennis Barone, “Petites Suites” by Robert Wexelblatt, and “So Long, Napoleon Solo” by Patrick Chapman. They are currently accepting unsolicited manuscripts and review every single manuscript that comes their way. Each manuscript, both accepted and rejected, receives detailed and careful feedback to help you as an author improve your writing and help prepare you for the next time. If you’re interested in working with this publishing company, you can send a query letter to their editor via email or use their contact form, found here. Based out of New York City, Diversion Books is a small, independent publishing company that was founded in 2010. They produce roughly fifty new titles every year and work with both nonfiction and fiction works. They’ve published books like “10,000 Bones” by Joe Ollinger, “2 Busy 4 Love” by Lucy Hepburn, and “So Glad to Meet You” by Lisa Super. Having started out as an e-book publishing company, Diversion Books now also publishing books in print, which can definitely help first-time authors reach a wider market! Diversion Books is currently accepting unsolicited manuscripts, but ask that you send a book proposal first via email. Be sure to include a summary of your book, along with the first three chapters of your manuscript for review in the body of the email. The team at Diversion Books works closely with their authors to produce, distribute, and market their books, which can be greatly helpful to those new to being published. Dreaming Big Publications is an independent publishing company that prides themselves on their ability to work one-on-one with their authors. They produce books in a wide variety of genres, and they don’t shy away from works that are original and a little out there. Some recently published titles that they’ve worked on include “The Legend of Sassafras House” by Anita Strafford, “The McKenzie Files” by Barry Nelson, and “Relationships 6” by Piers Anthony. They are currently accepting unsolicited submissions, but note that they don’t allow for simultaneous submissions. You can submit a query via their contact form. They are not currently interested in receiving book proposals. Rather, they are more interested in working with authors who have already completed their manuscript. They ask that you include the word count of your manuscript, its genre, the intended audience, as well as your contact information and a brief author bio. If you’re a first-time author who’s completed a children’s book, On Stage Publishing may be the publishing company for you. They publish chapter books, middle grade books, and young adult novels for both fiction and nonfiction. However, they do not publish picture books or short story/poetry collections. Books that they’ve published include “Mission: Shanghai” by Jamie Dodson and “Saving Da Vinci” by Annie Laura Smith. On Stage Publishing publishes in both print and ebook formats, which means you’ll reach a wider audience as a first-time author. They are currently accepting unsolicited submissions via email only. Be sure to check out their submission guidelines before sending your manuscript, found here. As a small publishing company based out of Philadelphia, Quirk Books dedicates a lot of its time to working closely with their authors. They’ve published several best-selling young adult series like “Miss Peregrine’s Home for Peculiar Children” and “Pride and Prejudice and Zombies.” If you have a manuscript with a quirky premise, Quirk Books may be a great choice for you. They are currently accepting unsolicited manuscripts via mail, but ask that you email a query first. They ask that your query letter include a brief description of your project, along with a few sample chapters for review. If they like your work, they will ask that you send your full manuscript via regular mail, along with a self-addressed stamped envelope (SASE). For more information on their submission guidelines and who to send your query letter to, click here. Tor/Forge is a publishing company that prides itself on having an open submissions policy, which is a great opportunity for first-time authors who don’t yet have any representation in the publishing industry. Every single submission that they receive is reviewed by a member of their editorial staff, so first-time authors don’t have to be worried about whether their work is even considered. They ask that you send the first three chapters of your book, a synopsis of your manuscript, a dated cover letter that includes your contact information, and a SASE via mail. They do not require that you send a query letter first, as they are more than happy to read all submissions. For more details on their submission guidelines, click here. If you’re a first-time romance author, Avon Romance is an excellent choice in publishing company. Whether you’ve written a contemporary romance, historical, erotica, inspirational romance, paranormal, romantic suspense, or a western, Avon Romance is on the lookout! They’ve published books like “Beautiful Sinner” by New York Times bestselling author Sophie Jordan, “Shades of Wicked” by Jeaniene Frost, and “Duchess by Design” by Maya Rodale. While they’re currently not accepting submissions for the remainder of 2018, they will be opening up soon come January 2019 and encourage you to come check back later. You can use their online submissions form, found here, once they’ve indicated that they are once again open to submissions. Turner Publishing Company is an independent and award-winning company that produces both fiction and non-fiction. They’ve published books like “It’s A Bun Life’ by Nick McGinn Jr. and Katja Russell, “Another Kingdom” by Andrew Klavan, and “The Jane Austen Diet: Austen’s Secrets to Food, Health, and Incandescent Happiness” by Bryan Kozlowski. They are currently accepting submissions for manuscripts or book proposals, but only from literary agents. If you’re a first-time author who’s interested in working with Turner Publishing Company, it may be a good idea to consider finding a literary agent who can get in contact with them on your behalf. Due to the high volume of submissions that they receive, they unfortunately cannot accept unsolicited manuscripts. Angry Robot is a publishing company that specializes in science fiction and fantasy books. Founded in 2009, Angry Robot works closely with their authors to publish works in print, ebook format, and as audiobooks. Based out of Britain, Angry Robot is a partner with companies like Penguin Random House and Simon & Schuster, which means first-time authors will receive a great deal of attention and work with people with tons of publishing experience. Similar to Turner Publishing Company, you should consider hiring a literary agent if you’re interested in working with Angry Robot publishing. If you do have representation, have your agent send Angry Robot a query by either email or through their contact page, found here. For more information on their submission guidelines, click here. Quarto Knows is a publishing company with world-wide reach, with offices in Canada, the USA, Mexico, Russia, the UK, China, India, Australia, and more. They’ve published books like “Light Magic for Dark Times” by Lisa Marie Basile and Kristen J. Sollee, “The Secrets of Stonehenge” by Mick Manning and Brita Granstrom, and “The Electric Pressure Cooker Cookbook” by Barabara Schieving. They produce books from a wide range of genres, which is great for first-time authors looking to reach out to a publishing company. They are currently accepting submissions, but ask that you contact the correct department with a query. More information about their submission guidelines, as well as who to contact, can be found here. Bigger isn’t always better, and the team at Small Beer Press prove that everyday. Small Beer Press is a small but might independent publishing company that was founded in 2000 by Gavin J. Grant and Kelly Link. They publish books in both print and ebook format, and work closely with an in-house editing team to help their authors make their manuscripts shine. They’ve published books like “Terra Nullius” by Claire G. Coleman, “Alien Virus Love Disaster” by Abbey Mei Otis, and “Half-Witch” by John Schoffstall. They accept unsolicited submissions by mail only, and request that you send a mailed query first. They do not publish nonfiction or poetry collections. They ask that in your query you include a synopsis, along with the first ten to twenty pages of your book. Be sure to include an SASE so that they can reply to you. For more information on their submission guidelines, click here. Founded in 1984 by Jennifer Joseph, Manic D Press is based out of San Francisco, California. This publishing company produces fiction, poetry, and nonfiction about pop culture, art, music, and more. They’ve published books like “Escape from Houdini Mountain” by Pleasant Gehman, “Forty Ouncer” by Kurt Zapata, and “Sorry, We’re Closed” by J. Tarin Towers. They are currently accepting unsolicited manuscripts via email only. If you’re sending in a novel, they ask that you send a synopsis and the first chapter for their consideration. For all other types of works, they ask that you check out their submission guidelines, found here. If you’re a first-time nonfiction author, Allworth Press may be a prefect fit for you. They specialize in publishing nonfiction books about a wide variety of topics. Some of their published books include “Acting for Film” by Cathy Haase with a foreword by actor Ian McKellen, “Love & Money” by Anne-Margaret Carrozza, and “The Artist’s Compete Heath and Safety Guide” By Monona Rossol. They are currently accepting submission, with specific interest in books about graphic design, business, performing arts, interior design, art, theater, web design, book arts, photography and crafts. They ask that you submit a proposal that includes a brief query letter, a synopsis, a chapter outline, information about your intended audience, a few sample chapters for review, and a brief author bio. You can send all of this via email, as hard copies will not be accepted (unless directly asked for). Ulysses Press is another great option for first-time nonfiction writers. They publish cookbooks, books about crafts, healthy eating, pop culture, exercise, and senior fitness. Some of their titles include books like “The 100 Best Gluten-Free Recipes for Your Vegan Kitchen” by Kelly E. Keough and “Buddha in Your Backpack: Everyday Buddhism for Teens” by Franz Metcalf. They are currently accepting unsolicited submissions, but ask that you review their guidelines carefully, found here. They ask that you include a brief synopsis of your manuscript via email, a table of contents, one or two sample chapters, some information about yourself, who your intended audience is, and a few comparative titles that you think your book is similar to. Unnamed Press is a small publishing company that works closely with their authors to produce truly high-quality and entertaining books. Some of their titles include “The Body Myth” by Rheea Mukherjee, “Silver Girl” by Leslie Pietrzyk, and “Famous Adopted People” by Alice Stephens. They are currently accepting submissions for a wide range of book genres, and ask that you send a query via email. If their editorial team is interested in your work, they will reach out to contact you. Founded in 2009 by Laura Spencer and Mark Cugini, Big Lucks is a publishing company that specializes in poetry collective journals and chapbooks. They are especially interested in works from writers of the LGBTQIA+ community, nonbinary writers, writers of color, undocumented writers, refugee writers, and unpublished writers. Some of their books include “That Which Comes After” by Alexis Pope, “Chateau Wichman” by Ben Pease, and “Like Kansas” by Simone Savannah. If you’re hoping to get your collection of poetry published, Big Lucks may be a good fit for you. They recommend that you check their submission guidelines, as they are not open to submissions at all times of the year. You can find more information about when they’ll open back up for submissions here. Akashick Books is based out of Brooklyn, New York and love to work with authors of urban literary fiction and political nonfiction. They are particularly interested in works of black interest, Caribbean interest, LGBT interest, and more. Unfortunately, due to a high level of submissions, they are currently not accepting new submissions at this time, but encourage authors to try again at a later date. They do have several flash fiction web submissions available, however. If you’re interested in these flash fiction events, feel free to check out their website here for more information. Curbside Splendor Publishing was founded in 2009. They published fiction, nonfiction, and poetry collections. This independent publishing company has produced titles like “Charlatan” by Cris Mazza, “Ars Botanica” by Tim Taranot, and “Body Horror: Capitalism, Fear, Misogyny, Jokes” by Anne Elizabeth Moore. While they currently have no open calls for submissions, they encourage first-time authors to check back at a later date. This small independent publisher loves to find new talent and work to cultivate their authors’ careers. 19. Page Street Publishing Co. Distributed by Macmillan, Page Street Publishing Co. publishes young adult fiction, children’s books, and nonfiction. Some of their titles include “It Should Have Been You” by Lynn Slaughter, “Home and Away” by Candice Montgomery, and “Khalida and the Most Beautiful Song” by Amanda Moeckel. They are currently accepting unsolicited submissions, but highly recommend that you review their submission guidelines, as there are specific departments that you need to contact if you’re looking to submit your manuscript. For more information, click here. 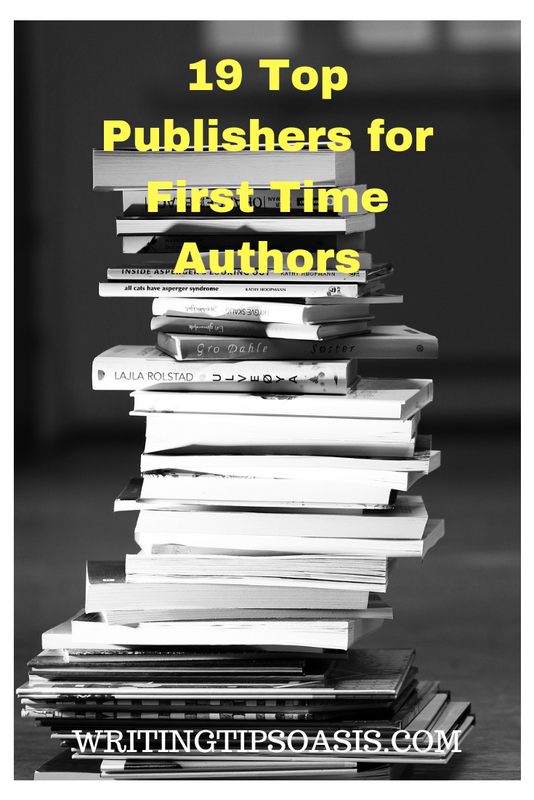 Do you know any other publishers for first time authors? If so, please tell us about them in the comments box below!